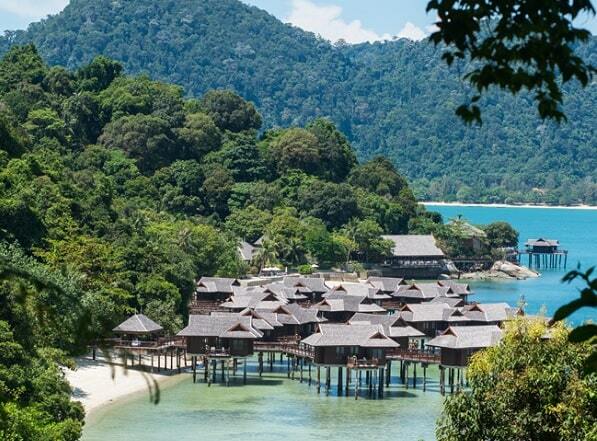 The luxury resort on Pangkor Laut is surrounded by lush and pristine rainforest. It is claimed that the forest is millions of years old. True or not, it is a fantastic place. Furthermore, the island has a number of beautiful bays with beaches. You will find 3 beautiful bays on the island: Royal Bay, Emerald Bay and Coral Bay. The only resort on the island is built in old traditional style and offers all the modern luxuries that a sophisticated traveler desires. The enchanting, spacious villas are located on stilts above the water or on a hill between the palms with a beautiful view over the sea. The Spa Village contains one of the best Spas in the world, with its own bathhouse, countless treatments, yoga and Tai Chi. In this absolute peace and privacy you can stay in one of Spa Villas on stilts. It is a romantic destination and very suitable for honeymooners. The resort has won several awards. 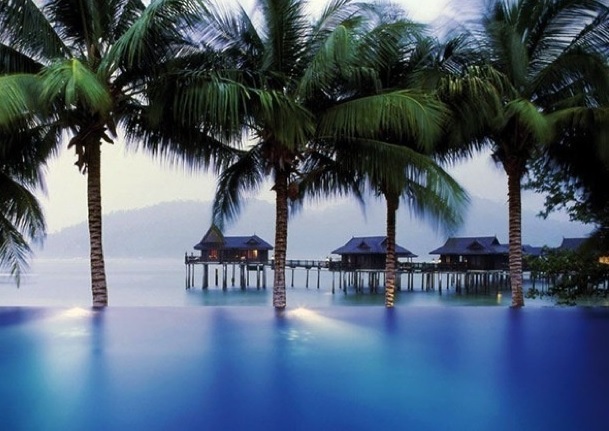 Not for nothing does Pangkor Laut carry the concept: "One Island, One Resort". The journey to Pangkor Laut starts on the mainland at the official resort office, where your luggage is collected. You are asked to pose for a photo, which is sent directly to the island so that the staff know your face and your name. Just a refreshing drink and then a short walk to the jetty, where a modern Motor Cruiser / TaxiMotor Cruiser / Taxi awaits, which ensures a relaxing trip to the resort. The trip to the island takes about 25 minutes. As you approach, the excitement also increases. The first thing you notice when entering the private port of Pangkor Laut is the impressive jetty, which leads to the front of the resort. When you disembark, you immediately feel special with the attentive staff of the port. The reception staff are waiting for you. After the formal check-in with a friendly smile, cold towel and a fruit drink, you will be taken to your Villa. Each guest is assigned a member of management, depending on the language. With him / her you can go for questions, or individual wishes for a great holiday. You can discover the gastronomy of the resort by going with an expert guide and chef to do some shopping. 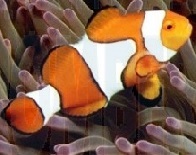 You visit the local fish market of Pangkor, the anchovy shops, the noodle makers and a fish farm. You return and cook three recipes with the chef. It's just a great way to see how the resort pays homage to the local environment and uses the best of Malay products. The adventurer can take a jungle walk with a nature expert on the island. From fruit bats to snakes (almost harmless), which reside on the island. Your eyes are opened to the natural beauty and wildlife of this beautiful island. You get the chance to view monitor lizards and crabs before going on a jungle trip. it takes 30 minutes, but take sunscreen, insect repellent and a hat. The tour ends at Emerald Bay. you can take a much needed dive and a cocktail on the beach.The adventurer can take a jungle walk with a nature expert on the island. From fruit bats to snakes (almost harmless), which reside on the island. Your eyes are opened to the natural beauty and wildlife of this beautiful island. You get the chance to view monitor lizards and crabs before going on a jungle trip. it takes 30 minutes, but take sunscreen, insect repellent and a hat. The tour ends at Emerald Bay. you can take a much needed dive and a cocktail on the beach. There is also a longer jungle tour, which lasts 2 hours. You can do this at ease. If you are romantic, you can try the Sunset Cruise. This is a fantastic way to sail around the island. On board the cruise, various drinks and snacks are served, while you sink into comfortable cushions on the upper deck. With a glass of excellent pinot in your hand, see the sun setting in the sea. Emerald Bay is located on the west side of the island. The bay is considered by many independent travelers and consultants as one of the most beautiful beaches in the world. True or not, the management of Pangkor Laut has left Emerald Bay as natural as possible. The exception is the eateries. This in addition to the beach trips, which last all day. 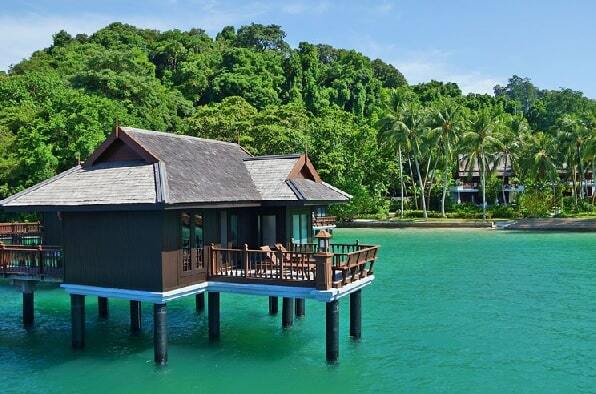 Royal Bay is located east of Pangkor Laut and offers views of Pulau Pangkor. There are 4 different luxury villas each with their own specific architecture: Garden Villas, Hill Villas, Beach Villas and Sea Villas. Coral Bay offers an extra dimension: isolation. It is further away from the main reception of the island and collection points.